The ever-changing political and military landscape of George R.R. Martin’s A Song of Ice and Fire ensures that no Great House can hope to maintain control for long. But although the players may change, the fundamental game will always remain the same. A Dance with Dragons is an expert-level six-player scenario for A Game of Thrones: The Board Game Second Edition. An alternate setup presents the Houses as they stand at the beginning of the fifth book in A Song of Ice and Fire. The game of thrones has raged for some time, and many characters have died since the beginning of the series, while more have risen or fallen in importance. To reflect this, this expansion includes 42 alternate House cards, which present previously unseen characters. is a special scenario that immediately thrusts players into a grim struggle for survival. After a brief alternate setup to reflect each House’s position in Westeros, you’ll quickly be forced to forge new alliances and discover new strategies. 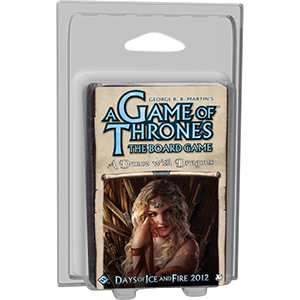 This is an expansion to A Game of Thrones the Boardgame, and a copy of this is required to play.